This article is about the Yoshi's Island boss. For the recurring species of large Boos, see Big Boo. 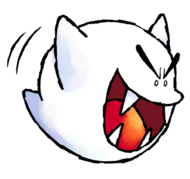 Bigger Boo is the mid-boss of World 2 in Super Mario World 2: Yoshi's Island. He is encountered by Yellow Yoshi at the end of World 2-4, Bigger Boo's Fort, starting out as a normal Big Boo. However, Kamek arrives and uses his magic to increase the size of the Boo. He does not attack Yoshi, instead floating around the room and chasing him when he isn't looking, and he can still be stopped by facing his direction, though he also turns intangible, meaning that he cannot be attacked. The player must toss eggs in a way that they ricochet off the walls and into him while facing away from him, though with each hit Bigger Boo increases in size. 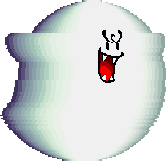 After hitting him five times, Bigger Boo's size increases to a point where he explodes, defeating him. This page was last edited on September 30, 2018, at 13:17.